Starting treadmill running programs, especially when used as a beginners running program, are really a great way to get started in running. Whether you're looking to lose a few pounds or just to keep your body in tip-top physical shape. Running in any form certainly helps you reach either of these goals. -Treadmills are also a very good way to keep your running training schedule going, right through the winter, when the weather outside may not be all that great for running. The best treadmills offer a variety of training benefits for the experienced runner and the beginner runner alike. It’s important for you to get the maximum benefit from all your time spent on the treadmill and not have any of it wasted. If you're a beginner runner, the key to running on a treadmill, is to make sure you start out slowly. It can be easy at the beginning to over do it and cause an injury. -Personal trainers as well as doctors recommend 30 minutes of exercise every day. For a beginner runner, a total run time of 10 minutes a day is a good starting point. Running too much too soon can cause muscle strains and pulls at the start, and discourage new runners. Once you've been running for 2 or 3 weeks you can increase your running time to 20 minutes a day, then gradually 30 minutes a day, more if and when you're up to it. -It doesn't need to be all at once either: 15 minutes twice a day, 20 minutes once and 10 minutes once a day, or even 10 minutes three times a day will do just fine. You can also use the ever-popular run-walk beginner runner method: running-walking for a total of 30 minutes each day. Walking most of it at the start, and as time passes, increasing the running time until you are running the entire 30 minutes. The most obvious benefit for running people -is the fact that you can run anytime you want without worry of wearing any special clothes or driving to the gym. You can keep your regular running training program right on schedule, no matter what the weather. -Whether it's the snow and freezing temperatures, or the sun and high humidity, oftentimes an outside running training program can leave a lot to be desired. Running on a treadmill can solve that problem. It's always warm and dry inside, and there's always time for a quick run. For the beginner runner, treadmill running programs can give you a chance to build up your stamina, so when you finally do hit the bricks, the usual start and stop routine of a beginner runner may even be completely unnecessary. However, with treadmill running there are no excuses - it's always there when you're ready ....for a short stroll or a hike up a mountain. Treadmills come with gauges that indicate running speed, distance and time you've run. Some of the best treadmills can even tell you how many calories burned running and even your target heart rate. -Most gauges are calibrated for the average runner, and so the readout for calories burned running, may be off by as much as 20% for some runners. Even those that have you enter your weight first are not always accurate; there are just too many variables from person to person. But if you're using a second hand treadmill, it's still very important to be sure these gauges do work. They may be a little inaccurate, but they really are unbelievable motivators and a great way to track your progress, and to set goals for yourself. -When you see the miles add-up and the calories burned running increase, it really makes you want to run even more. To burn off one pound of fat you'll need to burn 3500 calories, so if you're running to lose weight -you'll need to change your eating habits as well for faster and more long-term weight loss. Many treadmills also offer pre-set programs. Treadmill running programs often include programs for weight loss as well as hill climbing, endurance and speed programs. Many machines also offer you the ability to custom-design your own programs. This setup is ideal for the beginner runner as well as for experienced runners who have been running for-ever and are using a treadmill to fill in the gaps in their running training schedule. -As an example: If you're training to run a race or a marathon and it's been pouring rain all week, you can still get your required miles in on the treadmill. -Running on a treadmill is generally easier and a lot safer because of the lack of obstacles you need to navigate around and over. -There's also no wind resistance. -Rain and snow are no longer a problem, and no more oglers for the gals out there. -No hard pounding of your body on asphalt to cause shin splints or bad knees. 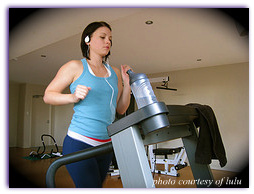 -Incline can be set to simulate hills and to tailor your run to your fitness level. -Some models even feature padding, making them easier on the body, especially if you're a little overweight or are prone to knee problems. -Treadmill running, like any form of running can be hard on your joints, so it's really important to wear good runner shoes. The proper running shoes can mean the difference between a having a good run and taking time off due to sore feet, blisters or worse. So if you're looking for a great way to meet your fitness goals and maybe even lose a few pounds along the way, treadmill exercise programs just might be the answer you've been looking for. -Some people have a tough time dealing with the monotony of treadmill running programs, but then again ....when was the last time you watched Ellen or the ballgame, or even read a good book while going for a run? Although running on a treadmill is easier on the knees, running after 50 or any form of exercise after 50 is always a great idea! Running And Depression - Why Running Exercise?